Graceful, athletic, intelligent and full of personality, bottlenose dolphins have long fascinated humans. This spring, Georgia Aquarium launched an all-new AT&T Dolphin Celebration that showcases dolphin behavior and their relationship with their trainers. Not just a show, it also incorporates important educational messages. 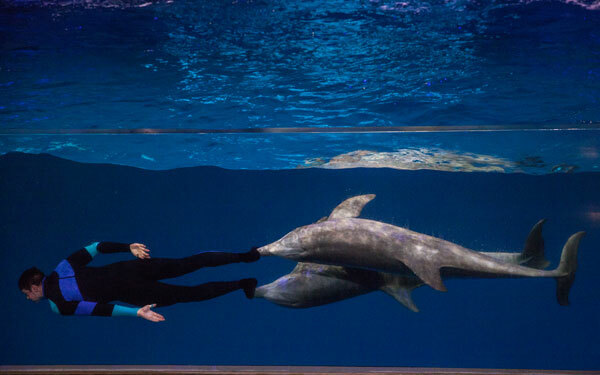 To dive a little deeper, we talked to senior trainer at Georgia Aquarium, Andy Horn. 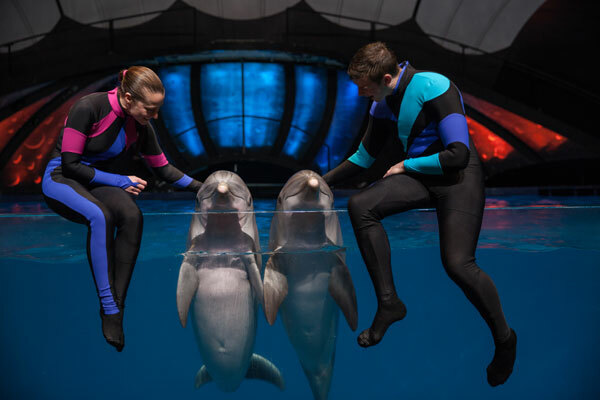 On the relationship created between dolphin and trainer : Building relationships with the dolphins is probably the most rewarding part of our job. Many hours of interaction are spent with each one of our dolphins, learning about their strengths and likes, to help us form a relationship with them built on trust. It is a humbling experience to form relationships with these incredible animals. On becoming a trainer : My first opportunity to work with dolphins came during an internship at an accredited aquarium after college. I was interested in cognitive research with dolphins. 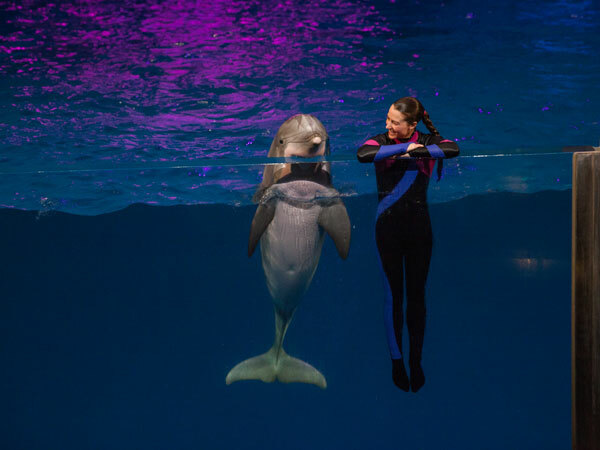 Once I learned about how much we can learn from the dolphins by teaching them behaviors, and how integral the training process is to providing the dolphins an enriching environment and world class care, I was hooked on animal training. On communicating with dolphins : Our dolphin-training program is based on a positive reinforcement system. To communicate with the dolphins we use hand signals, because of their excellent eyesight. A certain hand signal will request a dolphin to perform a behavior they have learned is paired with that signal. We’re able to communicate to the dolphins that the behavior they offer is correct by pairing it with something they find reinforcing or rewarding. Again, this is where our relationships with the dolphins are so important so that we can offer them a reinforcer that continues their excitement and motivation to learn! We use a variety of different types of reinforcement with the dolphins, such as toys, rub downs, ice cubes, or fish. On the different personalities of dolphins : Each dolphin has a different personality. The fun part of our job is getting to know each dolphin as an individual. On love of dolphins : I love dolphins because there are characteristics about them that are so familiar. They are social mammals who learn from one another and pass on what they've learned to their offspring, very similar to us! At the same time there are characteristics about dolphins that are completely alien. I have no idea what it's like to spend minutes at a time under the water, or to have a sense like echolocation! But, I imagine it would be pretty amazing! On what to expect and what guests can learn : What I really hope our guests take away is how amazing the natural world is around us. Sometimes we get so busy in our day to day lives that we might forget that, but I believe that seeing, and learning about the dolphins during the presentation is a great reminder. It is that inspiration that I hope will energize our guests to take action to help our environment and the natural world. 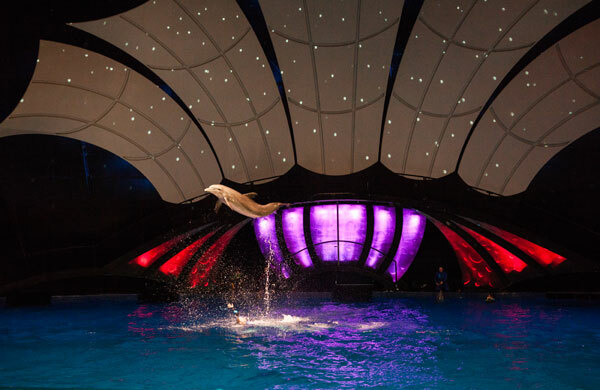 On the difference of Dolphin Celebration from the previous Dolphin Tales show : Of course, the new dolphin presentation features several brand new behaviors from the dolphins! 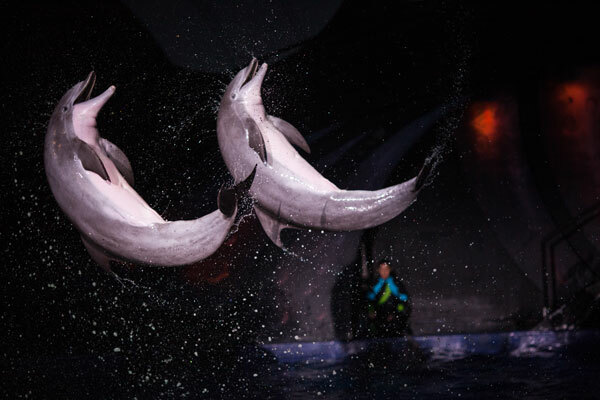 The behaviors feature the dolphins performing in tandem with both one another and with their trainers. "Dolphin Celebration" also highlights the conservation efforts that the Georgia Aquarium has been and is currently undertaking with Common bottlenose dolphins and encourages our guests to take action for the care of our environment. What else : Everyone come out and celebrate with us and our amazing dolphins at "Dolphin Celebration!" Thank you so much for your support and sharing in our mission "to make a positive impact on the health and welfare of aquatic life around the globe." Thank you so much to Andy and the team at Georgia Aquarium. Check out more from Georgia Aquarium on their blog . 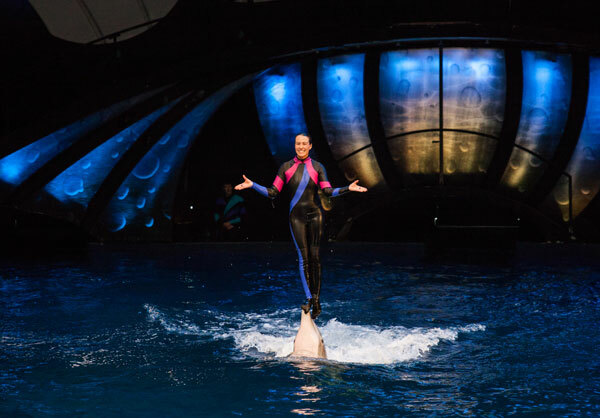 Admission to the dolphin presentation is included when you visit Georgia Aquarium with an Atlanta CityPASS and available on a first-come first-serve basis.